Electricity consumption is typically the second-biggest cost incurred by indoor cultivation facilities (and often greenhouses), behind labor. 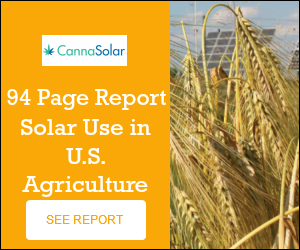 According to cultivation company data analyzed by the nonprofit Resource Innovation Institute, grow facilities on average expend about 275,000 kilowatt hours per square foot of canopy. Some grows spend much more, while outdoor grows spend little or nothing on electricity, according to Derek Smith, executive director of the Portland, Oregon-based research organization. While reducing your cultivation site’s electric bill without making major sacrifices on yield and quality may sound like a tall order, there are ways to do it. The two biggest consumers of electricity, according to a 2014 study performed by the Northwest Power and Conservation Council, are lighting, which accounts for about 38% of energy consumption, and dehumidification and ventilation, at 30%. Cooling takes up 21% of power demands, while the remaining 11% of power use can be attributed to heating, water management, CO2 and curing. That said, the easiest place to seek energy savings is through lighting – in addition to heating, ventilation and air conditioning, or HVAC. Here are three ways to cut your electricity bill. To save on power, you first must know how much electricity you’re consuming and what it is being used for, such as lighting and HVAC. The simplest way to measure how much you’re using is to calculate your kilowatts per day. Next, estimate how many hours per day your lighting and HVAC equipment are running and at what power level to understand how much juice is going to each. Growers should know that the amount of lighting and HVAC being used will depend where plants are in the growth cycle. Outside conditions play a role, too, because air conditioners and dehumidifiers must work harder on hot and/or humid days, respectively. “It’s kind of a guestimate, but it’s better than nothing,” Rivero said. To get more accurate data, Rivero suggests using power monitors that can be placed on breaker boxes to track electricity consumption based on a particular power source, such as a specific wall of air conditioning units or lighting panels. How many breaker boxes a cultivation facility has varies on the size and design of the facility as well as what kind of power service systems (single phase or three phase) and voltage power the site. Yerba Buena, for example, has individual subpanels for lighting in every room as well as a panel for each of the facility’s 10 HVAC units. There are also panels for less power intensive equipment, like water pumps. Basic power monitors cost between $600 and $1,000, while the most expensive models can hit $10,000, Rivero estimated. A cultivation site doesn’t need to buy a power monitor for every breaker. But having several makes it easier to run comparisons, say between different grow rooms, different days or between lighting and HVAC units within a room. In addition, energy-management companies can install data equipment to make it easier to track and manage power consumption. While lighting uses the most electricity at indoor grow sites, most cultivators still use high-pressure sodium lights, typically 1,000 watts. Not only is the wattage a major energy drain, but HPS lights produce high heat, forcing air conditioners and dehumidifiers to work harder adding to utility bills. More efficient and environmentally friendly LED lights have been around for several years, but only a small number of growers have adopted them. Many growers acknowledge that LED lights are more efficient but argue that they don’t produce the yields that HPS lights do and, therefore, reject them. For example, Massachusetts marijuana industry executives were up in arms in March after regulators imposed a cap on electricity use amounting to 36 watts per square foot of cultivation space. The move, in effect, forced growers to adopt LED lights a move some executives hope to overturn. When Allison Justice arrived at San Diego County, California-based OutCo in late 2016, she also was told that LED lights couldn’t perform like HPS lights, and that whatever the cost savings, they would be lost to the lower yields that were expected. Justice, OutCo’s director of cultivation, wanted to see for herself, so last year she started running trials comparing 1,000- watt HPS lights with LED lights from Fluence, a commercial LED firm whose wattages were 330, 560, 660 and 1,000. More wattage equals more light intensity. Testing on two strains, Justice and her colleagues found the LED 1,000-watt lights produced 21% higher yield than 1,000-watt HPS lights, while 660-watt LEDs resulted in 13% more yield and a 37% drop in energy use. At 37% decrease, Justice noted, didn’t account for savings from the air conditioners, which ran less because LEDs give off less heat. Justice acknowledges that LEDs are more expensive – a Fluence 660 is about $1,280, while a standard HPS light is around $400 but the cost is more than outweighed by the energy savings and increased yield. Another advantage of LED’s: They allow growers to “double stack” a layer of plants on top of another one, effectively doubling the cultivation space. How? Because HPS lights are so hot, they must be farther from the plants than LED lights, which are cooler. “It’s like getting another facility for free. The ROI on that is a no-brainer,” Justice said, referring to return on investment. Finding ways to reduce HVAC power use is good for the environment and your company’s finances. Yerba Buena was able to get rid of its dehumidifiers, for example, which significantly reduced the company’s utility bills. How did the Oregon grower do it? It adapted sensors that measure leaf moisture and air humidity and wired them to activate air conditioners (which also perform dehumidification) when the leaf surfaces reach a certain moisture level. Remember that leaf surfaces can transpire moisture because of heat from grow lights. By activating air conditioners when leaves start to transpire – versus waiting for a preset interval Rivero can both absorb air humidity and lower temperatures that had risen because of light heat. That, in turn, reduces leaf transpiration even more.